What could speak more clearly about mankind’s insecurities than the power invested in objects, from the pagan amulet to the scrap of the wood of the true cross to the lucky interview pants. Objects that carry very little value in monetary or functional terms can carry great value as symbols of something we care about, of a privately held link with our past or with an idea or person that gives them some personal significance. More than this, objects can be loved – full stop. This cannot be called a symbolic love, because it is felt as actual affection. My example is a collection of vinyl records stacked inside a cupboard for twenty years while CDs and newer technologies took over. Yes, I weeded through them and packed some for the charity shop. Then weeded through them again and offered them to friends. I watched them disappear to new homes, and if I knew the home to which they were destined I felt slightly better. Was I going to play any of these records again? No. Did I have some of these albums on CD? Yes, the ones I most enjoyed listening to had been replaced with CDs long ago. Did I love these records (as different to ‘this music’)? I have to say, yes. These records had walked through life with me for a long time. I was getting rid of them with good reason – to free up space. Rational. Sensible. I knew I would not use them again. Stifle the heartache. Goodbye, Leonard Cohen. Maybe this was a goodbye to past feelings, or goodbye to a younger self. Yet those feelings and memories, and even the music on the albums, in my head and heart, survive the rout of the records. So maybe I simply loved the records. What does this say about human love? I hope it does not devalue the love we feel for people – that we might share out affections with objects, which, after all, don’t matter as people do. No, people should still come first if placed in a competition with objects. There might even be an argument that, when things go wrong and we make bad choices it can be when we give too much importance to objects – when we fight for possession. And alternatively, we might fight in support of ideas and find conflict between human- and idea-love. Human has to win. I recently toured the West Bromwich Albion football ground. I’m not a fan of football and it was purely a chance offered that I took up with a vague feeling of interest. In the spanking-clean, recently built, dressing rooms (with their aromatherapy tang! 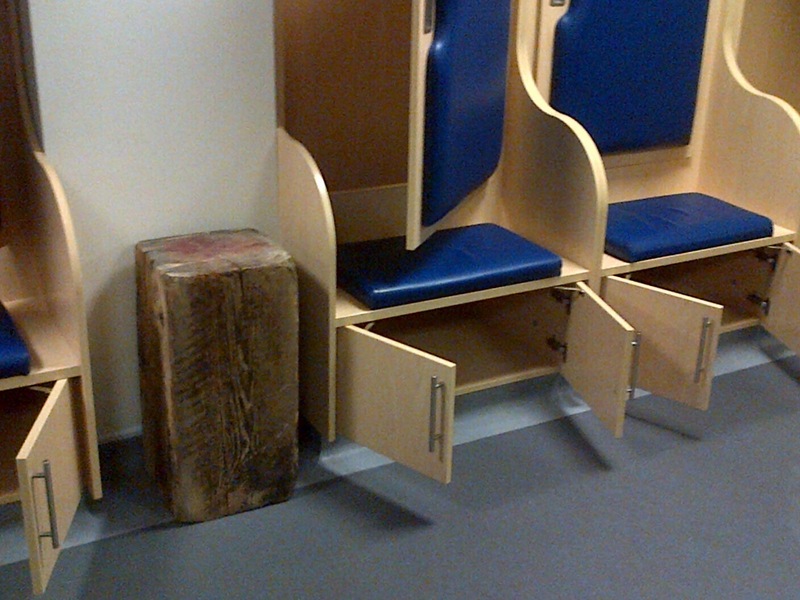 ), there was an old log of wood placed totem-like between the benches. We discovered it was from an oak tree that used to grow on the ground. In the past apprentices used to soften the players’ boots by dipping them in water. The boots were then thwacked against the log, which bears the marks, to give them more flexibility. Now it stands, simply a beloved object. One can’t see it being tossed in the skip any time soon despite its present lack of function. Of course, sports and religions gather rituals and sacred objects. What does it mean? Perhaps it means that, despite the attachment we might have to logic and rationality in our everyday lives, there lurks in the depths attachments which are not justified on those terms. In the end, we are not going to be sensible. We will be ourselves, loaded with stuff which might, like decrepit age, be tied to us like a tin can tied to a dog’s tail, but which is singularly our own, our life’s accompaniment. Well, the edifice we build with objects is an aspect of our identity, but one we need to be careful about. 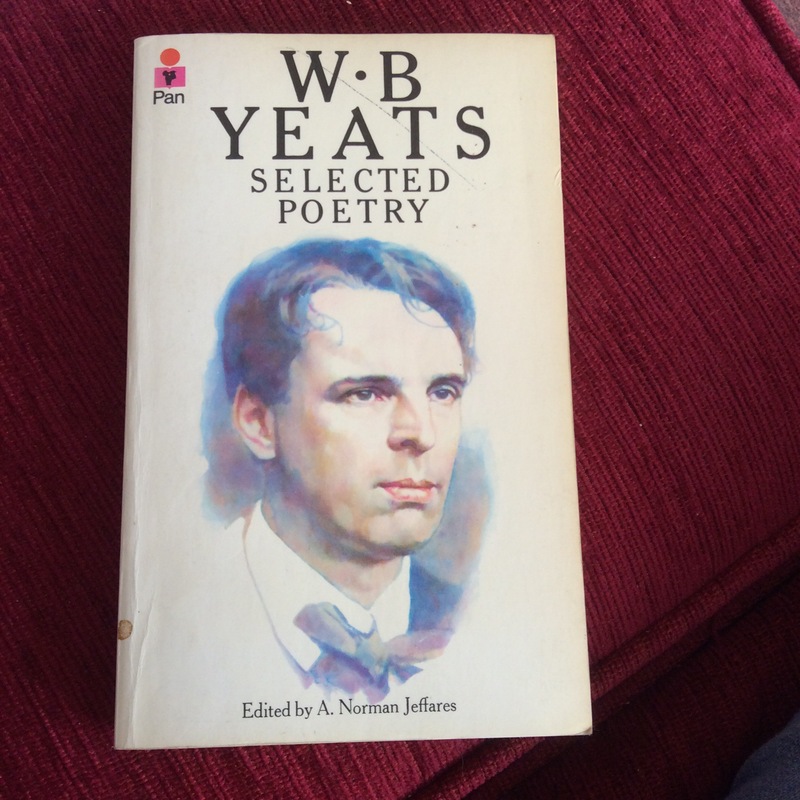 And I doubt I’ll ever throw away my copy of his selected poems from ‘A’ level. 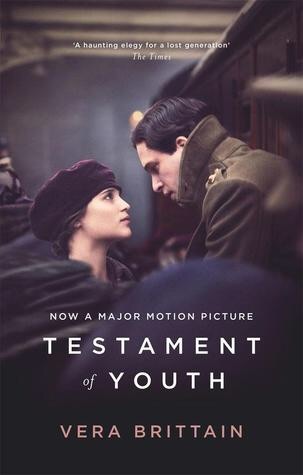 ‘Testament of Youth’ is a fascinating account from a well-bred English girl with a streak of rebellion at her centre. Determined to get a good education she fights tooth and nail to get into Oxford as one of the first female students in preference to settling into a middle-class country life, and after WW1 she indeed becomes one of the first women to be allowed an actual Oxford degree. High-minded and with poetic sensibilities, she falls in love with a high-achiever and has friendships with men where discussions whirl around religion and morality. As time passes and brings amazing and life-changing experiences she becomes increasingly politicised and active, but not without the pains of bereavement and disillusion which she feels belong to her generation alone. Perhaps she earns her right to be a little scathing about the following generation of young people and their jolly optimism. There is a touch of priggishness, and the blue-stocking, going on, but this is part of the charm of the testament – a testament to a lost world and lost values. I was reminded of ‘Parade’s End’ when I read this book, with its feeling of ancient values being snubbed and belittled. Vera’s experiences after the war amount, for her, to a snub of her struggles during the war and the patriotism she and her contemporaries brought to that. A VAD during the war, Vera had to put up with all sorts of petty regulations and a lowly status. After the war, clearly exhausted and traumatised, it took time for her to start living her life again and finding purpose. I think this would be recognised now as post-traumatic stress disorder. She finds her way onward through politics, in particular through pacifism and the League of Nations, but her experiences here paradoxically show her the futility of the war fought with optimism and spirit of self-sacrifice, to which she contributed her best-loved friends and her own energies. The peace rumbles on with promises of further conflict in the punishment of the defeated. The book is highly informative about this, and shows the further disaster taking root. Very much rooted in its time, the book moves slowly and becomes repetitive in places. There is poetry in there – it seems the best vehicle for the high-minded sentiments and for the following griefs. The language is elegant and introspective. We also hear a lot about Vera’s clothes, which is refreshing in such a serious book. VAD experiences are an eye-opener on life for the lowly nursing assistant in the stultifying hierarchy of the wards. We should read with awe for how far we’ve got (and maybe with more than a touch of gratitude). I’ve noticed that I’ve been using the words ‘insight’ and ‘insightful’ frequently lately. I’ve found them to be very useful terms, as they suggest that something essential has been revealed without tying this essential something down to something scientifically verifiable. When you want to say that a person has said something valuable but you don’t want to get embroiled in matters of objective truth, ‘insightful’ is the description to go for. Insight has some interesting properties. The fact that it exists as an idea, and the way the word is used, show that we think it is possible for a person to see inside an issue and draw out a special, revealing aspect of that issue through talent or intuition. On the other hand, if we attribute insight to a person, it means we recognise that thing they have found out as being valuable – it strikes a chord in us. This relationship is seen in the relationship of reader to writer in literature. The writer tells us something that is not verifiably true – it is in the context of fiction after all – and yet we recognise that something is described of which we already have some awareness, in the depths of our minds somewhere. The author makes it explicit. Of course insight is only one of the gifts a writer can have. There was a recent article in Brain Pickings that identifies memory as another, here. Why have I been using the word ‘insight’ so much? Maybe I’m scared of the word ‘true’. There is clearly a link between saying something with insight and saying something true. However, I was reminded recently that ‘truth’ is a disputed concept. There was a long conversation on twitter disputing it, which if you are interested you can trace by looking at my twitter feed around about 23/8/14 – @MarianRuthie. One of its selling points is that it can be read on a commute. Well I commuted from London to Birmingham without finishing it, and the commuter on the cover doesn’t stand much chance. But I can say that it starts well, by pointing out that truth, once the jealously guarded property of religion, has been rudely grabbed by science. So we are back to disputes. Truth has been coveted by many, but is a slippery thing. I intend to review the book. If this slim volume gives me some insight into truth I will let you know. Maybe it’s because I’ve been reading and writing about various bloggers’ formative reading experiences through #blogsync, or maybe it’s because I saw two ducks on a reservoir, but my head has been going back years to recall one of my early reading experiences and muse upon it. Once upon a time I was reading in class. I was about 12. Everybody was reading, which makes me think our usual teacher was away. I only read part of the book so it was not the book I had ‘on the go’, which was probably something by Daphne Du Maurier. I’m fairly sure the book was ‘The Sword in the Stone’ by T. H. White – not something I would have chosen. But the passage I read had such a big impact that I still recall it today. The embryos of all the species approached the throne of God in turn. God asked each what special gift it would like from him, who could grant anything asked, and each species asked for a useful extra such as broad wings, strong legs or an elegant trunk. God granted the requests and the animal kingdom came into being. Eventually the puny human embryo came forward. Surely such a weak and unprepossessing species could do with some enhancing features. But the human embryo said to God, “Lord, you have created me as I am, and nothing can improve upon the work of your hand. I wish, poor as I am, to remain as you have created me”. God was well-impressed with this statement, “You are right, my child, and in your righteousness I am going to give you dominion over all the beasts”. And so man was given the earth as his inheritance. Why has this story stayed with me? Partly because of the bizarre visual picture the queue of embryos conjured. For instance the embryos would surely have to float towards God, not having serviceable limbs. In my imagination they looked like jelly blobs with primitive body parts, and their ability to form an orderly queue was surprising, while their ability to talk …. Did they chat to each other while waiting, like sociable pensioners at a bus stop, meanwhile floating slightly above the ground, their delicacy protected? Or did they stand in silent awe, quivering in the divine presence? Then, there seemed to be some truth to the allegory. After all, place a chubby member of humankind, of the everyday sort, next to any of a selection of fine feathered or furred animals with their gloriously adapted physiques and physical talents. What alien approaching would believe that it was man that had conquered the earth? You only have to look at the hair on the man (or woman). Why does it grow in silly patches, leaving other areas embarrassingly naked? It appealed to me that such a poor specimen should be the chosen one of the god of mercy and compassion, and that the apparent last should turn out to be the first. In the frame of the story man was humble and accepted his frailty, and this humility was more valuable than all the fine gifts that God had given the other creatures. My hopeful 12 year old self loved this idea and stored it away. Mind you there is another way of looking at it. Man was cunning and knew how to stroke good old God’s ego. Given dominion over the earth he used his sly intelligence without scruple and ended up damaging it and all the other species over which he was given stewardship – pride, not humility. Of course it’s a myth, and what’s more, written deliberately as a myth, so a myth at one self-conscious remove if you like. But myths do have a truth. They are expressions of creative discovery; different from scientific discovery. This myth makes me think of man’s frailty. I think of the utter dependence of babies and the physical weakness of the old. Perhaps, under the terms of the myth, this lack of physical resilience prompted humankind to develop various compensatory skills, the big one being language. Being all-knowing God knew that humankind would have to be clever to survive whereas other species could simply be, and this cleverness would enable man to do great things. Then, a few days ago, I was walking with a friend near a local reservoir in the sunshine and we stopped to watch two great crested grebe. We decided that one was adult and the other adolescent, smaller but not with that endearing fuzz of the very young. The adolescent was following mum or dad at a distance, in a desultory way, occasionally stopping to gaze into the middle distance or groom himself, beak under wing. The parent was hard at work, every so often diving under the surface and swimming underwater to emerge suddenly further away. Youngster, unimpressed, followed on without apparent interest, clearly knowing but pretending not to care where the tiresome bobbing up was going to occur. Probably totally mistaken, we decided an underwater swimming or fishing lesson was in progress, with youngster failing to grasp the nettle. That’s what it looked like, although any grebe experts out there are welcome to correct us. Oh grebe embryo, you should have asked God for the gift of language so you could communicate clearly with any recalcitrant offspring. Teaching by showing sometimes lacks efficiency. Still, you have that pretty crest to show off. And a broad back to carry those delightful grebelets. And you can sail out over the glittering water, with the reeds whispering and the fish beneath, while we stand on the bank and natter on about building a raft. You might be sitting over a meal with Alexander Cleave, or, as he does at a point in the book, sitting in a darkened hotel bar in the middle of the night listening. He’s telling his life story. He’s telling it with wonderful panache. Every paragraph holds a gem of poetry. He is a raconteur, as befits an ageing Irish actor. He’s a bit of a tease, too. Was it spring? Did I see her on a bicycle first? He is the ultimate unreliable narrator. And what is more, even his unreliability is unreliable as we learn the ‘facts’ of the matter, if there are ‘facts’ to be learned. Which is more or less the essence of the novel. It’s about memory and it’s about how we form memories around ourselves, our judgements, our experiences. The links we might see in events, and there are many links between Alexander’s early life and his present, are not external but formed from our own narratives about ourselves. If this applies to all lives can there ever be an objective truth about what happened, and whether it happened when the leaves were falling? Alexander is an impractical type, and perhaps prone to embroidery of the truth, and there are more down-to-earth cast members in this novel, yet whether even they speak the truth can also be called into question. Alexander recalls his affair with his best friend’s mother at a time in his life when he was on the cusp between childhood and adulthood. Of course he was mightily self-absorbed. If he was going to lack the objective view at any time it would be when fifteen, and in love. The affair is never prurient; it is described with humour and warmth. The fabric of experience is described vividly – what it seemed to be like. The prose is wonderful. Without burdening the reader with description, scenes open out through telling detail, even the walls have ears; the surroundings and random objects have meanings and, sometimes, malevolence. And present events, which don’t come to much, and which I won’t spoil, shadow the recent and far past in his life. As I say it doesn’t come to much. There isn’t any clear resolution to the novel, although some facts become known, and spark the supply of certain other facts from Alex. This isn’t a novel for those who like their endings neat. Or their beginnings. But it is a fine story from a fine storyteller. You might recall that in my second post on this blog I said I would write about Allan Ahlberg’s autobiographical book “The Bucket, Memories of an Inattentive Childhood” (by the way, I have a first blog post, which no one seems to be looking at: here). My local library has now come up with the goods, and I have read this slim volume, not so much an autobiography as a collection of sketches, poems and memories from Allan Ahlberg, with illustrations mostly taken from his other books. Ahlberg was born in London in 1938, adopted by a couple who lived in the West Midlands (Worcestershire then), and brought home by his new mum on the train to smoky Oldbury to meet his new dad, who was working on that day, as on every other. They paid the solicitor £2:15:1. In itself, this is a history to reflect on. When Allan was told by a spiteful girl that his mum was not his real mum he confronted this strongest of strong women, capable of intimidating larger neighbours who dared chastise her child (“My kids…Hit your own.”), and she was reduced to tears, ‘her raw red cleaner’s hands twisting away at her apron as she struggled to speak’. But this isn’t a misery memoir. Ahlberg only touches on the sensitive nerve of his adoption as an aside in his account of the harem-scarem of a 1940s working class boyhood in which he, and all his peers, ran pretty wild (but with their own traditions of conformity) through the streets of Oldbury and Smethwick, protected from the sky by its smothering of antiseptic smog. This medical tang still hangs over Oldbury when the air is still. In those days, we learn, it came from British Industrial Plastics, Guest, Kean and Nettlefold, Danks, Chance and Hunt, Accles and Pollock, Brades – names in some cases living on in the street names of the area. To those who know Oldbury and Smethwick reading the book holds that added frisson that one is able to locate one’s own history in its pages – why is that so satisfying? It must be something to do with being able to place yourself on a bigger map. The book is so precisely set in place that I could imagine retracing the children’s steps on their annual, unsupervised, trip to a bluebell wood beyond Brandhall Golf Course. I know the canals, now overshadowed by roaring motorways. In Rood End Cemetery, where Ahlberg’s parents are buried, I seem to know that that other son of Oldbury, Jack Judge, who wrote ‘It’s a Long Way to Tipperary’ for a bet, is also buried (Stalybridge – he’s ours!). I must check if this is true. If you know please mention it in the comments section. But even without the local interest this book tells a story which is known – childhood. Ahlberg calls it ‘An Elemental Childhood’, characterised by encounters with dirt, sparks and water. Play was with worms, birds’ eggs and snails. The children were outdoors children and despite the industrial landscape knew about nature from allotments, municipal parks, gutters and canals. Ahlberg does not shirk telling it how it was: children who evaded the rough and ready adult control of park keepers and watchmen were sometimes drowned in pools or fell through ceilings in derelict buildings. But children were also independent, forming themselves into football teams in West Smethwick Park, organising ice slides on the snowy playground and taking themselves off to the woods in the spring with the baby in the pram. There was plenty to be scared of in dark hallways and alleys. In those days even domestic appliances were heavy gauge and intimidating – the mangle in particular – and the ham slicer at the butchers seemed to be menacingly alive to the child who could only glimpse it through gaps in the counter top. And although childhood is changed now, it still remains true that small children are the little people finding out about an alien land belonging to the giants. Allan’s eyes took it all in, and his author’s voice spilled it all out again in his charming but also sometimes slightly wicked, and even a little anarchic, rhymes and stories. Childhood playfulness survived in his love for playing with words. In one story, for instance, the clothes horse of his childhood is transformed into a mischievous horse made of clothes. This sharp eye, sharpened further by imagination, gives the lie to his teacher’s damning verdict of 1946, “Allan could do much better work. He is most inattentive ….”. Literature tends to expose and explore the political and cultural conventions of the day. In most cases this is not deliberate. Novels, or at least the best novels, are generally built on an interest in humanity not on agendas. Sometimes the social and political conventions come tumbling through, unquestioned, to land in a slimy heap on your enjoyment. This can be all the more painful if it lands on your nostalgia too. This was the book I read when I was stuck in bed with a bug – we were sent to bed when ill. It was the book I picked up for comfort reading, long past knowing the plot off by heart. I loved the canine characters with a passion despite my suspicion of dogs in real life. Of course it was because of their very best human qualities of loyalty, intelligence and individuality. But, hold on a minute, what about the beautiful Missis Pongo? Sweet, dizzy Missis Pongo, who has trouble telling her right from her left, who depends on her gallant husband and his calming influence on her femininity as they face the dangers of their quest to find their puppies. How could I not have seen through this? Can I forgive Dodie Smith (who also wrote the highly enjoyable ‘I Capture the Castle’), for implanting a sexist subtext in my impressionable mind? Can I allow myself to ignore the subtle influences emanating from the book? After all I also had the feisty Amazons to look to (I was even more wary of boats than dogs). And I have to wonder if Dodie even recognised, herself, what the character of Missus represented. And what else did I learn from ‘The Hundred and One Dalmatians’? I will never forget the description of the Dearlys and dogs contentedly strolling home from Regents Park in the evening, not knowing that they would hear the news that the puppies had been stolen – the happiness of a moment given the lie by its follower, beyond which nothing will be the same again. I will never forget Missis forgiving the boy who had thrown a stone at Pongo and injured him. As she approached him again the boy threw his bread and jam, for want of a nearby stone. Kind Missis decided that he simply needed a ball to throw, and his parents should buy him one. People currently call it emotional intelligence. Formative reading experiences are powerful things. Should we forgive books their non-PC subtexts? What about children’s books? Roald Dahl, anyone? Feel free to comment in the comments section. Maria is the accidental woman, a woman to whom things happen, with each step in life dictated by more powerful forces. A consciousness that starts with the memory of an accident in the hills on the outskirts of Birmingham, where she loses her family and scrapes her knee and knows the joy of being reunited, carries on in just that way. Maria is waiting to be found, indeed awoken, all through the story. She slumbers, while all around – friends, family, spouse – create their own narratives regarding who they are, what they feel and what they can do. Maria slumbers on, watching and also knowing with a clear dispassionate insight how things really are – she has no pretentions. Meanwhile, the writer is full of himself. He invites the reader in to marvel at the goings-on of all the characters, and to be amused. He’s a Jane Austen on acid, and maybe he needs to come down. But the journey is interesting and entertaining. So: a funny, interesting, sad novel; and a bit irritating. 3 stars. …..just can’t be separated, as shown clearly by Allan Ahlberg’s stand last week. Booktrust, the feel good children’s book charity, have sidled up to Amazon, the big business book leviathan. Or perhaps Amazon was the one doing the spidery come-hither, a bit difficult if you’re a leviathan. Ahlberg objects to tax avoidance. But it’s hellishly difficult to avoid Amazon. Many small internet booksellers are linked to Amazon as Amazon Associates. I fear I surreptitiously support Amazon by posting my book reviews on Goodreads. So if you read one of my reviews and want to buy the book please try to source it elsewhere and save my conscience. You could try hive. I’m pleased to be able to say that Allan Ahlberg grew up in Oldbury, next to Smethwick, the centre of the universe, or at least the cradle of the industrial revolution (one of them). He has probably stood shivering in the shallow end at the magnificent Rolfe Street Baths, now available to be admired at The Black Country Living Museum. He has written an autobiography. I’ve not read it. However, ‘Each Peach Pear Plum’ has been a mainstay of my career, and I think I may have gleaned some biographical background from the wonderful ‘Peepo’. Both books are illustrated with humour and delicious detail by Janet Ahlberg. In honour of Ahlberg’s principles I will read and review his autobiography, not sourcing it from Amazon, as well as ‘Each Peach Pear Plum’ and ‘Peepo’. I might try getting hold of them via the trusty Sandwell Library Service. His autobiography is called ‘The Bucket, Memories of an Inattentive Childhood’. Watch this space …..
Why does this make me suspicious about the book standing on its own merits? Chris Cleave is to be admired for his clear intent of making people sit up and take notice on the issue of asylum seeking. This book tackles this serious matter in a popular fiction format, but ultimately fails because the format cheapens the seriousness. Initially I was captivated by the narrative voice of Little Bee, a young woman from Nigeria seeking asylum in the UK. Her outsider perspective successfully cast the cool light of irony on British society. Her predicament rang true and she seemed a suitable character through which a story could be distilled. But the story turned out not to belong to Little Bee. It turned out that this was a book with large emotions on every page, a huge sweep of events and incidents which tumbled over each other at a rapid, too rapid, pace, with reader-manipulation cringingly obvious and the whole caboodle smothered with a big fat coating of melodrama. The result was that, sadly, the plot became unbelievable and the issues devalued. Oh, and the child, initially appealingly portrayed, just became irritating. So, one star for the character of Little Bee and one star for ambition (possibly misguided). And I nearly gave a star for some good writing and clever turns of phrase but unfortunately, by the end of the book, these started to feel like an over-indulgence by the author, the literary equivalent of empty calories. Read it to see if you agree!